Our Top 10 is IN! This year we found ourselves taking on new contracts for some great organizations and businesses and increasing our grant writing activities for others. We also stepped in as interim coordinators for the E.N. Thompson Forum on World Issues at the Lied Center, which threw us right back into the the throes of what we born to do: High impact production. As a result got to spend a fantastic day with Nadine Stossen and even grabbed a photo with Jon Meacham! We will continue to assist with E.N. Thompson this winter, until a permanent coordinator is hired. This year, upon the connecting of very helpful dots by UNL Law Professor Anthony Schutz and with the guidance of the Weibling Entrepreneurship Clinic, we officially created a nonprofit called The Grumble Project! The Grumble Project is where our Wuzzlewubbies (read below) project resides, as well as being the home for all future endeavors where arts and social services intersect at BLIXT. Our mission is this: To create high powered arts for humanity! You can expect a bevy of new works, podcasts, and philanthropic pursuits from The Grumble Project in days to come! This year, thanks to research, time spent in numerous classrooms, and through our participation in Bridges Out of Poverty with the Food Bank of Lincoln, we were able to begin to think more wildly about curriculums we created and to unapologetically add an SEL emphasis to all our work with students. This led to project-based, “whole child” learning in the classrooms we visited and culminated in some very exciting projects including the creation of a “Problem Simulator” for Math and English learning. (If you are a teacher, administrator, advocate, or elected official who would like to learn more about this work as well as evidence of learning, please connect to us online or by calling 402-817-8176). We were honored for a second year by working alongside and learning from our mentors at Mourning Hope Grief Center who have been instrumental in the creation and support of SNOWCATCHER (please see below) as well as in helping educate us about child grief and bereavement. A highlight of our year was volunteering at Camp Erin in Ashland, which serves children ages 5 - 15 who have experienced the death loss of a significant person. We also learned more about young adult grief support groups and recently received an Nebraska Arts Council grant that will help us further intersect performing arts and healing throughout Greater Nebraska this spring. 6. Grandma Didn’t Get Run Over By A Reindeer, But The Neighbor Did Destroy the PlayLab. So, here’s the thing: Becky and Petra are good at a lot of the same things, but are really good at quite different things. This has always served us well, and allowed us to take on a variety of exciting projects with “aces in their places”. This year, we hit a milestone in that not only did we split parts of our project load in ways that helped us each bring our best to the table, but we actually became so busy, that we split projects! That means that while one of us may offer the other support from our shared workspace, sometimes only one of us is the “lead” of a project we’re working on. We’ve found that this works well, and allows us to accommodate the needs of our clients and serve students of all ages in exciting ways. We are quite strategic about what assignments are given to each partner, and happy to report this model is working quite successfullly, so we’ll be sure to utilize it more in 2019. This year we were fortunate enough to work alongside amazing partners and clients. For example, we stepped onboard at our second home, the Lied Center for Performing Arts, to assist with development and their annual OnStage event. Only 24 hours later was the Lincoln Arts Council’s Mayor’s Arts Awards, where Becky gave a speech that was a call to action for Arts Education Advocacy. While our responsibilities for both events were quite different and required different levels of time commitment, we found that it made for a pretty jam-packed 48 hours. We also know that this is what we love most - to be a part of or to pull off something bigger than us from the ground up and to do it with passion and intentionality. Here is the video of Becky speaking at the Mayor’s Arts Awards, elegantly hosted and produced by the LAC. This is the first year we said no to things that aren’t the best fit for us and started to really curate our projects based on desire rather than building assured contracts. So far, this has been a great move for us and allows us the autonomy we want. Already we find we can bring our best work to the table by securing the best matches in terms of alligned partners, projects, and dreams. We like to go big and are always looking for partners who are action people who feel similarly. If you know us, then you know that new works for the stage is our jam. In 2018 we were lucky enough to partner with LGBTQA Resource Center Director Pat Tetreault and her staff to bring a new work to life at the Willa Cather Dining Hall. This joyful experience allowed us to mentor other artists into the kinds of positions we often fill and culminated in a beautiful staged reading on campus. 3. TheatreWorks USA Click, Clack Moo! At BLIXT, we’re big believers that when you see a chance, you take it, and last year we were given the chance to bring an Equity tour of TheatreWorks USA’s Click Clack Moo to several Title One Schools for Spring Break! We chipped in our own funds, got some support from others, too, and the result was over 500 children who experienced a play about warmth, empathy, and teamwork at no cost to schools or families. For many of the children who participated, this was the first play they ever saw! We also provided curriculum in tandem with the experience and held learning sessions in relation to the production at Clinton Elementary School. In January 2018, we realized that because of our work surrounding SNOWCATCHER and themes related to the Blizzard of 1888, we were missing an opportunity to bring local kids warmth and to draw an unmistakable parallel between navigating poverty in 1888 and in 2018. From our PlayLab, we dreamed of creating a blanket drive to help provide bedding to children in Title One Schools in Lincoln. With the guidance of our friends Michaella Kumke (and the Food Bank folks) and Dr. Marilyn Moore, we did some research and connected to Lincoln Public Schools to put a plan in action. Long story short, since that time we have provided over 550 blankets to students at the following elementary schools in Lincoln: Campbell, Clinton, Arnold, Elliott, and West Lincoln. 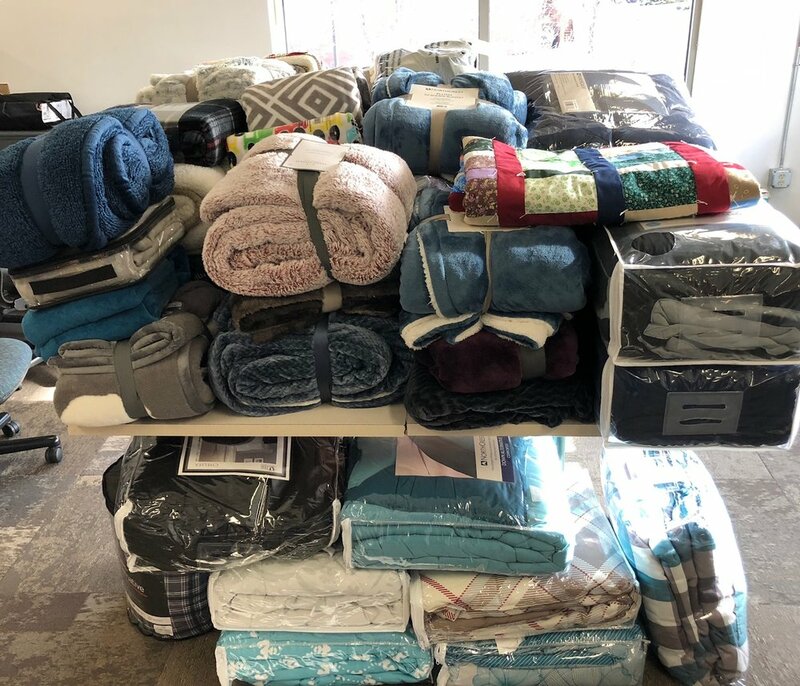 We love this work and will continue to collect new or homemade twin sized or larger blankets through the winter of 2019, with hopes to deliver at least 250 more before March. (If you’re reading this and not from Nebraska, sometimes it’s cold here through April)! We hope to grow our drive every year, and will the help of great community partners (for example, Lincoln Orthapaedic Group were generous donors this year!) we know we can bring more blankets to more kids who need them the months and years to come! A wonderful stack of warm blankets, waiting to become Wuzzlewubbies! Well, like with most lists, we’re certain we left out some pretty cool stuff here, but we’ve hit upon many of the highlights. We are grateful to do work we love, with people we love, to improve the community we love through high quality arts. We look forward to serving our state and region in 2019 - it’s already looking like it’s going to be an incredible year! Hello, friends. Becky here, writing on behalf of BLIXT. 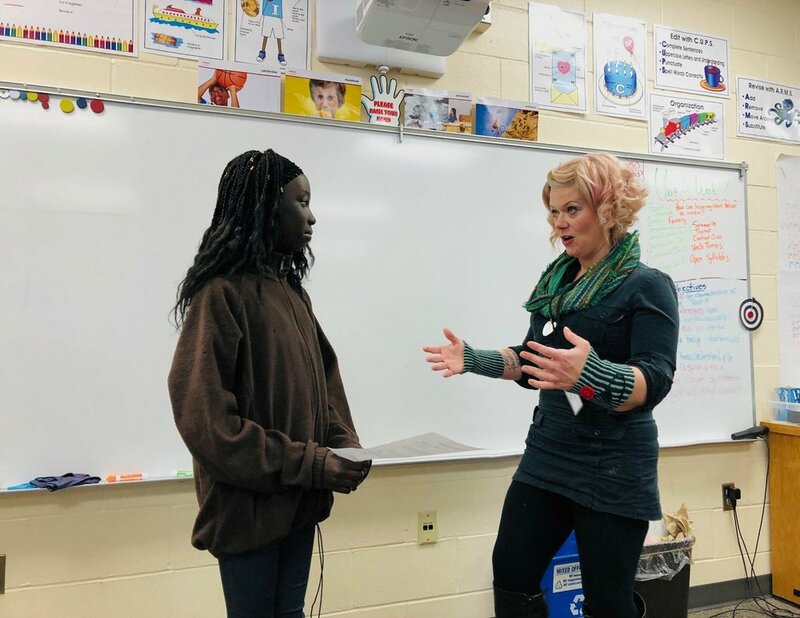 As teaching artists who are committed to social and emotional arts learning experiences, we seek opportunities to empower students by giving them a chance to see various subjects through the artist’s lens. Often our work places us in schools during “specials” time, meaning we teach in a time slot that is traditionally used for subjects like music, visual arts, or physical education. We aspire to serve the needs of students and their teachers and learn more about each school’s culture before forging a relationship. We are able to implement projects that are meaningful and focus on the whole child, but often walk away from a process wishing that we could also infuse classes that focus on traditional “core” learning and add a social and emotional arts emphasis to existing curriculum where it may be excluded. Our reason for that is simple: You must reach the child before you can teach the child. Recently, we’ve been given an unique opportunity to bring arts learning concepts to 5th grade Math and English classrooms at Campbell Elementary School in Lincoln, Nebraska. Campbell is one of our favorite schools, largely due to the amazing culture of learning and care set forth by Principal Julie Lawler. Campbell is also one of our “Wuzzlewubbies” schools, which means the students there are recipients of a portion of the blankets we collect during our annual drive. It is truly a special school, serving diverse families in North Lincoln. The model for this particular instillation of learning has looked a little different than most. For instance, prior to classroom visits, Campbell students were able to see SNOWCATCHER at the Lied Center for Performing Arts (thanks to the generosity of the Lincoln Arts Council and their sponsors). SNOWCATCHER is high energy, high stakes, and features one actor tackling (sometimes literally!) escalating problems, centered around the Schoolchildren’s Blizzard of 1888. It is a visceral, immediate play that doesn’t shy away from conflict, specially designed for young audiences and their families. I happen to be the author and actor. After the 5th graders came to Snowcatcher, Petra and I were invited to host a question and answer session with them, and it was remarkable to meet with the students and hear their thoughts about the experience. Being able to build this kind of repoire with the students and their teachers is a gift, and amplifies the opportunity for learning together. Following the Q & A session, we drafted a curriculum that incorporates storytelling with story problems and simple equations. I’ve been visiting classrooms and working with students on visualization and thought-catching, relating to what we experienced together in SNOWCATCHER. We are taking a fictional problem and escalating it, then solving it. We are acting out the problem, and allowing our characters to respond to stakes appropriately. We are also investigating what fuels conflict and are developing empathy with boundaries that helps us make strong choices about deescalation. The students at Campbell are so smart and kind and resourceful! They continue to surprise and amaze me with their responses. It’s important to acknowledge that what diversifies us also strengthens us, and by emphasizing the value of each student’s uniqueness or “story” we are able to have lively conversations around our shared learning experiences. Each class has a distinctly different culture, and after spending time with three separate groups, I’ve noticed that when dealing with our fictional problem, each group focuses on different probable scenarios. The first class really invested in the financial difficulties surrounding our story problem. The second was focused on the outcome of the children in the fictional equation. The third optimistically solved the problem and organically rewrote my script on the spot! This is a remarkable opportunity for arts teaching specialists and we are likely learning more than we can teach. Our ability to foster and build relationships through a shared arts experience and follow up visit are proving to be instrumental in the way we can affect classroom learning. I can only imagine what our students will create in our next sessions together, when they write their own dialogue and equation based around a source of personal conflict and resolution. Storytelling is problem solving. As I tell the students, “when we are surrounded by friends with whom we can share our stories, who will listen and also share their stories, we are building community.” We are so proud to be utilizing playwriting and storytelling to strengthen problem solving skills within the Campbell Community! Thank you to Principal Julie Lawler, the 5th Grade Campbell Team, and to the Lincoln Arts Council for making this experience possible. Review: SNOWCATCHER IS A MUST SEE! I have seen a number of one-person shows over the years and am always awed by the power and vulnerability of one actor on stage doing it all, but theatre is a collaborative art form, even if the form it takes is a one-person show. SNOWCATCHER is a 65-minute one act written and performed by Becky Boesen–one actor, seven characters. However, the show came to fruition through the collaboration of arts organizations across the state, from the Historic Midwest Theater in Scottsbluff to the Lincoln Arts Council, Blixt, and the Lied Center. A team of artists brought their skills to the collaboration to bring this one-person show to the stage: Director/Sound Designer Robin McKercher, Costume Designer Donna Himmelberger, Lighting Designer Kim Williams, Lighting Specialist Del Delorm, Technical Director Melanie Rudy, and Executive Producer Petra Wahlqvist. Walking into the Johnny Carson Theater, the audience is greeted with an empty chair in front of three long white pieces of fabric suspended from a tall frame all held in warm light…and silence. At first, I thought some pre-show music would be nice–the smattering of early arrivers were whispering as though in a library or a tomb–but after sitting with the silence and the empty chair for a few minutes, I felt the impact of that emptiness, the drama of absence and changed my mind–well done. SNOWCATCHER addresses uncomfortable topics of death and grief and fear…and asking the audience to sit with silence and absence is a powerful first moment. Boesen tackles, and I do mean physically tackles, six additional characters who Hattie introduces and talks with in memory and dream. This is a full-body endeavor where Boesen rolls, crawls, high-kicks, kneels, jumps, dances, fights and uses every bit of her energy to bring the story fully to life. Under Robin McKercher’s direction, the transitions between characters are quick and clear with fast physical shifts and vocal differences that distinguish each character. The utilization of the white fabric and chair create memorable, dynamic moments. The space, storm, and transitions are further realized with sound and lighting that bring the blizzard into the theater. The quick shifts and unpredictable thought process of a six-year-old girl spin and whirl quickly through a story of struggle and grief, but near the end in a moment when Boesen drops fully into her own voice, she (with some additional help from lighting and sound) brings us a moment of lightness and hope. Boesen was asked if she’d consider writing a story about this historic storm. Her process and the creation of this work bring her clear answer: I am the storm. SNOWCATCHER plays at the Carson Theatre at the Lied Center Thursday, October 18 – Sunday October 21. For tickets contact the Lied Center box office 402-472-4747 or online at liedcenter.org . Summer Lukasiewicz is an actor, director, writer, educator, the Executive Director of Flatwater Shakespeare Company, and a lover of well-told stories.